Make the most of your marijuana seeds! 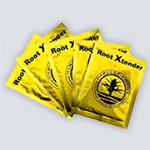 Nirvana's Yield Kit includes our three bestselling growth solutions: 5 Sachets of Root Xtender, 5 Soiltabs and 5 Flowertabs. That's all you need to harvest in an irresistible value pack! 5 sachets filled with 5 grams Mycorrhiza. So you get 25 grams of mycorrhiza in total. We have also added rhizobia: beneficial soil bacteria that fix nitrogen and ensure the best possible growing conditions for your precious seedlings and clones. A packet of Soiltabs contains five 100% organic tablets that provide a constant source of nourishment to your marijuana plants. Each tablet contains a balanced mix of bacteria and humic acids designed especially for growing cannabis. A packet of Flowertabs contains five 100% organic tablets. Flowertabs will slowly biodegrade, releasing measured doses of nutrients while the fungal ingredients strengthen and extend your roots just when your plants need it the most. Please note grow solutions will be shipped separately from seeds. Onze klanten zijn erg positief. 4 kwekers bevelen dit aan.